Once upon a time, back when I sported a blue polyester uniform and saddle shoes, I won a typing award. Yes, I could type a whopping 45 wpm after a year of high school instruction. In college, my parents gave me the latest and greatest in technological advancements – an IBM Selectric. Oh yeah, I was definitely all that and a bag of salt & vinegars when I would type a few words and they would scroll across a tiny computer screen. In my first job in corporate America, I had an ancient typewriter on my desk and there was one computer for the entire office to share! Locked away in a glass enclosed room, it was like Fort Knox. Do you think 100 years from now, people will be on the hunt for old Mac Airs and Dells to display in their Jetson like homes? For now, I’ll stick with the old stuff and even wear it on my wrist. How fabulous is this typewriter key bracelet. I absolutely must have a typewriter bracelet! everything is wonderful – I love the spiritual pieces and of course the typewriter bracelet…when you have so many beautiful pieces to choose from it’s difficult! Love, love, love the typewriter key bracelets! In fact, I’m ordering one for my daughter who is a writer. She’s going to love it. Thanks much for the introduction to JuNxtaposition and the chance to win. I just love the prints and the tags and the key bracelets!!!!! Sorry, picking only one was too hard. Thanks for letting us know about this wonderful little gem. I love the silverware handle pendants! Thank you for the opportunity to “meet” this sponsor and the chance to win something special. My favorite is #42 the spiritual necklace that says “amen”. That typewriter bracelet is too cool, I would love that!! Lovin’ the “blessed” handle pendant! I was the person in the glassed in room. My first job was working on computers at 16. Back in the day, they were HUGE and had to be climate-controlled. That bracelet is the bomb!! These are absolutely FANTASTIC! I would love, love to win an ‘M’ key necklace (‘M’ for Mollie and also for Mommy!) Even if I am not chosen, I think I’ll have to make one mine very very soon! : ) Thanks so much! I adore the wings and a prayer Christmas ornament, but the spiritual necklaces and bubble pendants are lovely too! Thanks for sharing her site. I love the # 48 pendant that looks like a spoon! I love her typewriter bracelets so much that I ordered one myself!!! My mother had one of these old typewriters it brings back wonderful memories and the fun of trying to type fast on one of those beauties! I love the typewriter key bracelet. Thanks for the chance! typewriter bracelet # 110! So Cool!! I am a big fan of bracelets of any type, but the typewriter ones are adorable! I, too, learned to type on both a manual and IBM Selectric (loved the little type (font) balls)……. I would love the old typewriter! Looking for one. That works. The Handle Pendants are the best! I loved the typewriter pendants … but then the sheet music bubbles caught my eye … before I clicked on the spoon bowls … and then caught sight of the handles. Sigh. I was a kid, flipping through the Christmas wish catalog! But my finger finally landed on the dictionary bubbles! OMG I love it all. I really like the old skelton key, very cool. Would love to be the winner. Love the typewriter key jewelry…love the site. Thanks for sharing! BTW…love your too! The handle pendants are adorable, so are the typewriter bracelets. Such decisions!!! I like the typewriter bracelets and the spiritual necklaces. i am a simple girl and i love he pendants with just one letter! I love Junxtaposition’s work!! I would love a typewriter bracelet or a silver spoon pendant. Unique and gorgeous. Thanks for the opportunity. Good luck to all! I have one old typewriter Brawn picked out of the trash. Then when I liked it, he brought me two more which I promptly sold on Ebay to someone making jewelry. Why didn’t I keep them for myself? I actually have one of her key necklaces. I love it. She feeds my obsession with old keys! I LOVE the typewriter bracelets. They are so fun! I would love a typewriter bracelet for my girls that would say “2Joelle” and “2Eleora”. My must have is a typewriter pendant. I love the old keys and I love pendants! Thank you for hosting this awesome giveaway! Maybe someday you’ll offer up your 7-Up sign. ha ha! Love it! I love the typewriter jewelry. I would love a bracelet with at least a 3, J, P and Z…that covers all my kids and grandkids too. 🙂 Thanks and good luck everyone! I love that she will take any number that you choose and make it into a pendant. This would be great for someone who is celebrating a special milestonesuch as a Birthday or Anniversary. Very Cute! Love to have that typewriter key bracelet! you’re showing your age….lol…i too wore the polyester uniform and was a typing wiz at my high school! those of us who could type the fastest got to graduate to the brandy new age ‘electric’ typewriters !!! wow….who would have ever imagined what we have to work with today !!! thanks for the post. !!! “you rock me harder than a downtown band” …. The typewriter bracelets are so meaningful to me, who spent 33 years as a journalist – pounding the pavement for stories and pounding the keys to bring them to life! MUST have one of those bracelets!!! Wow! It’s impossible to pick ONE favorite! I like everything! I do love the typewriter bracelets, however! Probably my next favorite would be the bubbles! If I win, I would choose the bracelet. Probably. Maybe. I fell in love with the typewriter key bracelet years ago. Still didn’t buy one keep thinking I will get it for a gift sometime. Thanks for a chance to win!! I would love to win a typewriter bracelet. I absolutely adore old typewriters. They make me think of typing class. I actually had a teacher who would whack our fingers with a ruler if we looked down at the keys. This wasn’t even private school. I purchased one of Jeanne’s typewriter key bracelets a couple of years ago at the Country Living Fair – I love it! The spiritual necklaces are beautiful, any one of them would be a treat. Thank you for a chance at winning one of her lovely pieces! i absolutely love the bubble necklace vintage and music bubble! Thanks for the chance to win. Love the typewriter bracelet and necklace. I so want a bracelet. It doesn’t matter the key, they are all beautiful. I love the typewriter jewelry. Particularly the cute bracelets! So much to love on her site! Eclectic, unique and one-of-a-kind, just my style! If I have to narrow it down to one I would go with Skeleton Key no.large 120. I recently found your website and signed up for your emails. 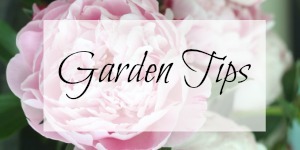 I have thoroughly enjoyed all of the fun inspirational ideas and information you are so kind to share. Your charming dialog is the icing on the cake. I truly look forward to your emails! Thank you and keep sharing! Those bracelets are totally charming! Have a great week, Kelly! Lovely typewriter! I am actually searching for one in SC now! I love the typewriter pendants. So adorable. I would probably chose the letter “K” for Kelly. I really love the sheet music bubble necklaces. My daughter is in Varsity Choir and I think I will get her one of those. She will have to most unique piece in the entire choir. I also love the typewriter keys. Awesome! I love the Dictionary word bubble pendant in FEMME!!! I love your typewriter bracelet too! The prints she has in her shop are really neat. I would choose the typewriter bracelet though. 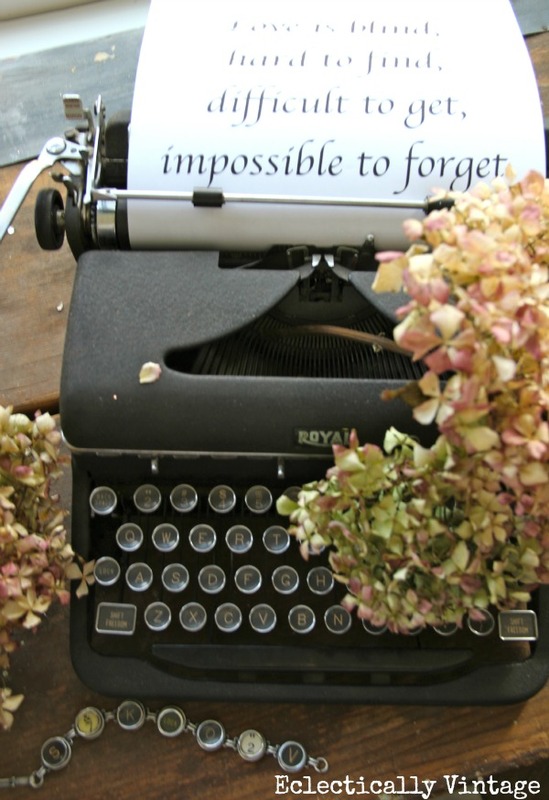 Your story made me really think…I learned to type in high school on an IBM Selectric. I’m actually very glad to have learned that skill. Just imagine not knowing how to type! I love the typewriter key bracelets! i too love the typewriter bracelets! we have my parents manual smith corona that was portable. it presently resides in our daughter’s room to add to her decor. all of jeanne’s jewelry is beautiful. going to check out her blog and follow on twitter. Love the typewriter key bracelets, but I think I’d like a necklace, too! I love, Love, LOVE your vintage Royal typewriter!!! I have a vintage Underwood typewriter in my Art Studio…Studio One!!! It is EXACTLY like the one I learn to type on in High School…YIKES!…know you can guess how OLD I really am!!! Ha! I love all the jewelry, but I particularly like the spiritual necklaces (I think I saw a St. Christopher medal on one!). And the typewrite key bracelets are fantastic. I have an antique store in Savannah Tn. One day a week I dress in period dresses. The bracelet would be a perfect addition. Also good advertising for her website. Thanks, looking forward to hearing from you. I really like the multi charmed spiritual necklace. But the typewriter pendant is adorable as well. I have the typewriter my mom learned on. It’s one of my simple treasures I just cherish! So I’d love one of the pendants. 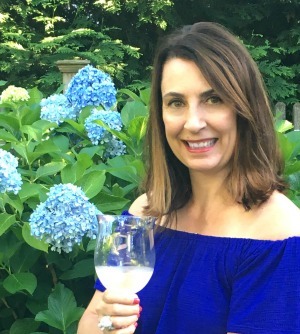 Love your blog Kelly! Always makes me smile! i love the typewriter necklace. She has so many wonderful things. Thank you for this giveaway. I love vintage typewriters!What a beautiful bracelet!LOVE her necklaces too! My absolute favorite is the “artist” handle pendant! She offers a lot of wonderful pieces making it hard to choose! I would choose my initial – J. The typewriter keys bracelet is still my favourite. Love! Thanks so much for hosting this beautiful giveaway! I have a typewriter key bracelet that says “love” and I just LOVE it. Wear it almost every day! I love the bracelets but I might get just a typewriter pendant necklace with either my initial or my husbands! I absolutely LOVE the typewriter bracelets…hope I win! Thanks for the giveaway. would love the spoon pendant! beautiful! I absolutely LOVE the typewriter bracelets!!!! I remember typing on a machine just like that when I was in business school, before they got the electric typewriters! I could never get up any speed on them, because I didn’t have enough strength to hit the keys so they would register!!! I love those dictionary page bubble necklaces. Think I should go for, “awesome” or “worm”? Ooohhhhh def. like the spiritual collection. P.S. I love your blog, too. I just went over and I love the “L” charm 🙂 . I also toured your home, Your foyer is fantastic. Actually, I like all of your rooms. You have such great curb appeal. Where are you in NJ? You must tell me where you go hunting for your treasures. 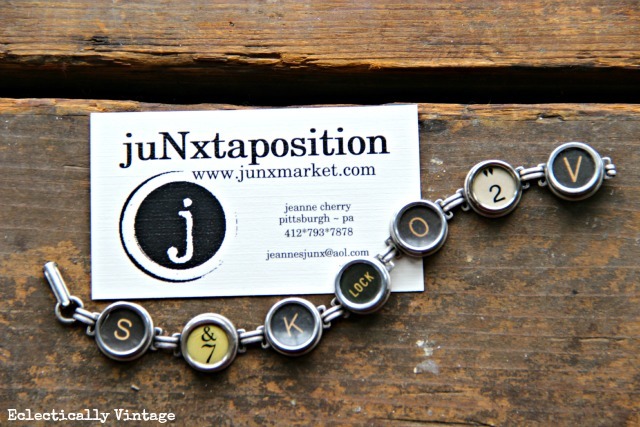 I love Jeanne’s shop and everything in it… but the typewriter key bracelets and pendants are my favorites. 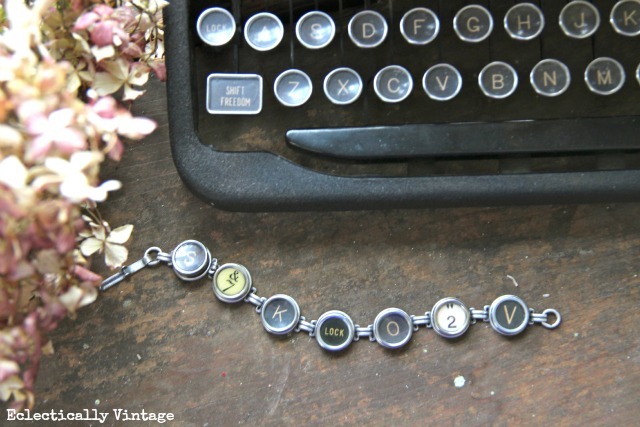 Love the typewriter bracelets–all of them and would live to have necklace #22–,love it! While all the items are adorable, I am in love with the vintage dictionary word bubble pendants. I love it all! Jeanne does a beautiful job! I think the formica hang tags are great fun items! Everything is so gorgeous! I want it all!! My favorites are the typewriter jewelry, yes, I took it in school too. My fastest was 60 words per minute. Nothing compared to the kids these days! I really love the silverware pendants too! I’m torn between the typewriter bracelets and the dictionary word bubble pendants. Maybe I’ll have to buy both! Typewriter bracelets. Love, love love! How unique everything in the shop is. I really like the spoon pendants, but really am drawn to the typewrite key bracelet. I love wearing muliple bracelets and these are just so colorful. I think the typewriter bracelets are my favorites too, but I also love the silverware handles. Her tags are really cool too! Thanks for the chance to win one of her pieces!! I LOVE the bubble pendants and the spiritual necklaces, especially the one that says “pray.” Thank you for this opportunity! Love Love the bracelets and pendants. Thank you so much for introducing us. Quite taken with the vintage sheet music bubbles; everything actually. Thanks for the giveaway and sharing juNxtaposition with us. Great creativity!! I love the key necklaces the very best if I had to choose one. love the key, spoon handle, and typewriter key necklaces! I really like the spritual necklaces, they are so nice. Thank you both for the chance at the giveaway! Great post and awesome bracelet! I’m off to check out her goodies … thanks for sharing! I adore the typewriter key bracelets! The print ” for like ever” is a top pick for me, too. Very nice stuff. Unique and great prices, along with free shipping? Total find! I love the typewriter key bracelets!! Great idea! I would love a typewriter bracelet …..
Love the typewriter jewelry – necklaces and bracelets. Thanks for the awesome giveaway – count me in!! I LOVE the typewriter bracelet but she does have lots of nice stuff! I love the jewelry made out of typewriter keys particularly the bracelet that says “love you” Thank you for the introduction to yet another fabulous shop. Any one of those typewriter key bracelets would be a very welcome addition to my jewelry box. I would love a typewriter bracelet. I like the “On A Wing and a Prayer” Christmas ornament, even when it’s not Christmas! I adore the Bella handle spoon pendant! Thank you for a chance. I love all of her art. I soooo love the typewriter bracelets. I learned to type on an old manual Royal and wish I still had it. what beautiful jewelry her typewriter pendants are beautiful! The chick is totally awesome and her creative art is always unique. Separated at birth, I’m sure we were! I love the typewriter jewelry!! I bought several of her pieces already at the country living fair in Ohio!! I especially liked the bell necklace made from the end of a silver knife handle!! LOVE!! I love all of your and her creations! I also make things and stuff out of junk and bits and pieces. I am so inspired by the creativity. Keep up the lovely work girls! I can’t pick!! I love everything!! I love the typewritter key pendant! I love them all! I also was an ace typist in high school!! I have been wanting a typewriter key bracelet for so long – they are my favorite! My mom was a high school typing teacher! Fingers crossed on this one! Love the typewriter bracelet! And I love the idea of everyone sharing these wonderful sites! Thank you! Oh the days of manual typing-I am that old. Great necklaces. Kelly, I love the bracelets and the pendant necklaces. These are so cute and I love your post. Brings back lots of fun memories, like teaching myself to type from a typing book I found in our house when I was growing up! Thanks for the contest! I must have a typewriter bracelet! I love them! Thank you for offering this gift! Typing was my favorite subject in High School, so I took 4 years & learned on an antique manual one as pictured above. I would be thrilled to have a typewriter bracelet! They bring back fun memories! When I got an IBM Selectric I thought it was the greatest thing since sliced bread (and salt and vinegar almonds too)…..I have the same typewriter…love it…and love the typewriter keys bracelet! !…fantastic giveaway Kelly! Oh my goodness, LOVE that typewriter key bracelet best of all!! And oddly enough, my post tomorrow is on the IBM Selectric font ball! 🙂 I think my Selectric was among the first, for there was no little screen on it. But boy, did I love that typewriter, especially after having learned to type on the old Royal manual! 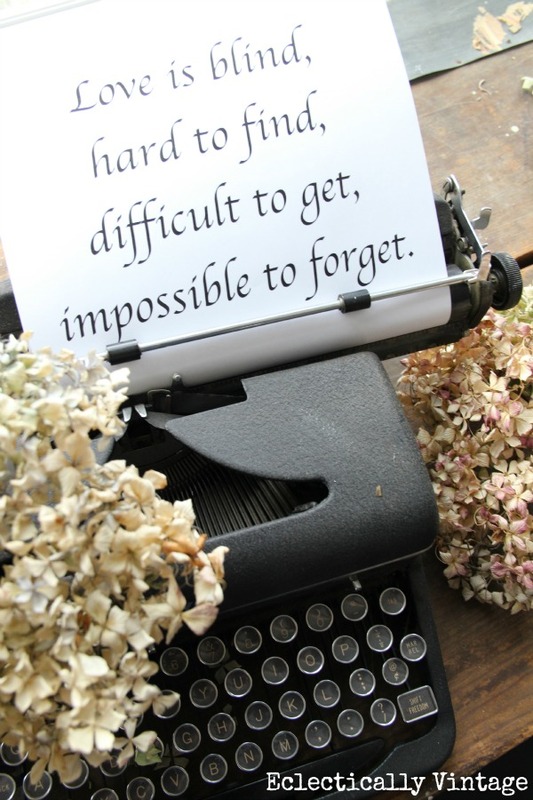 Love, love your typewriter!! I have a 1956 pink Royal typewriter of my dad’s and it is so special to me. Funny to think about displaying an old Dell, lol! I cant begin to tell you how much I want an old typewriter. Those bracelets are so pretty, love them. I also took a typing class, no awards for me, I was pitiful! LOL. Love the typewriter bracelet and the necklace. I was a former business teacher and first took typing on these old typewriters, love them!!! Too back the drawing is over, I would have love to win. Visiting from Southern Style. What a fun statement piece! In addition to her typewriter bracelets, I also love her necklaces made with skeleton and brass keys – actually, I love everything she makes!! I would love a necklace or piece of jewelry with old keys.